I’ve just completed two miniatures of Mascotte passing Portland and Back from a Rescue . Just got to frame them and they’re ready to go off to the Hilliard Miniature Society tomorrow along with four more. 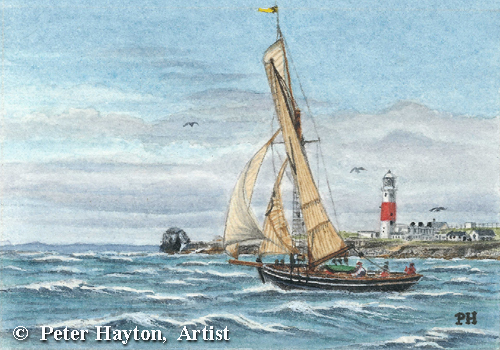 Mascotte Passing Portland Bill is a miniature painting of the Pilot Cutter Mascotte passing Portland Bill lighthouse. This painting is a conglomeration of two photos taken from our boat at different times. Mascotte taken while it was racing in Plymouth Sound and the Portland photo we took as we passed the Bill on our way west to Dartmouth. 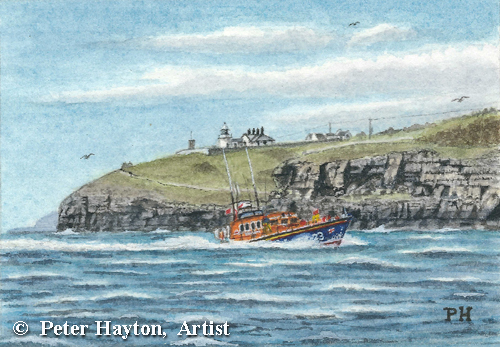 Back from a Rescue is a miniature painting of the Swanage lifeboat passing Anvil Point lighthouse off the Purbeck coast of Dorset. Also known as the Jurassic Coast. This was taken from a photo Anne took while we were out running along the coast on our boat Work of Art.